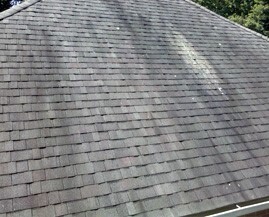 The “black streaks” or “stains” that appear on your roof are living organisms that are feeding off of your asphalt roof! Eating your roof alive, literally! Climates with warm, humid summers like ROCHESTER!! The spores on the northern exposure of the roof stand a better chance of survival because that portion of the roof is the last part to dry after rain or morning dew. This raises the humidity on the surface of the shingle, thus creating a perfect breeding and feeding ground. Shingle manufactures changed from all asphalt to fiberglass shingles. The limestone in the fiberglass shingles which, is added for weight, attracts the bacteria and begins to spread. The tar used in roofing is fossilized, dead organic matter — and an important food source for fungi. Asphalt, at the granule base, is normally consumed first. Once these granules dislodge, accelerated deterioration will occur. Ceramic granules represent the outer hard shell that protects against hail and other falling debris. Ceramic granules protect against damaging UV radiation and insulate the roof against extreme heat. So you can understand that their dislodgement by the growing fungal colonies can be detrimental to our roofs’ longevity. The “dark stains” on a roof act as a sponge to absorb the sun’s heat, which causes a rise in the temperature inside a home or building, creating higher air conditioning bills. The spores, which are on your roof, can get inside your home because they end up on the driveway and walkways from rain, and are easily tracked inside. They can even be drawn into our air conditioning systems and eventually populate our ducts. Choose a permanent, energy efficient, metal roof for your home. 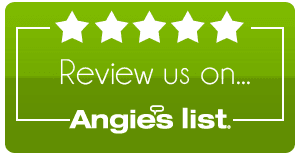 Asphalt shingles are a thing of the past because they just don’t last!